Keep kids healthy…if only this was as easy as it sounds. 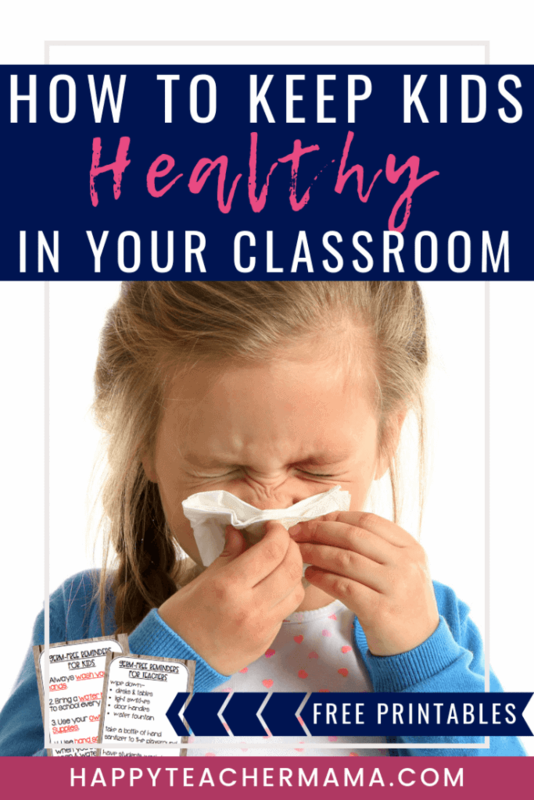 Most of the time, it seems like no matter what you do as a teacher, sickness infests your classroom. Then inevitably, you end up sick. Trust me, I’ve been there. However, making a few simple changes to your daily activities will have a huge positive impact on the number of kids who stay healthy this cold and flu season. This first way to keep kids healthy is so obvious that it’s almost cliche. However, the reason I mention it is because this skill needs to be taught. Proper hand washing is vital to preventing germs in the classroom. There are so many excellent resources to remind your kids to wash their hands including these FREE hand washing posters from the CDC. However, you need to do more than just have a reminder poster. It’s imperative that we teach our kids proper hand washing techniques. This includes how long to wash their hands as well as the appropriate temperature in which to rinse. 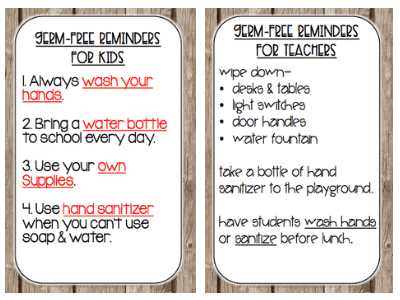 Moms Against Cooties has some great tips for teaching correct hand hygiene. Remember, this will definitely require time and effort from you at the beginning of the school year, but the return on the investment will be well worth it. We all know that one of the worst places to pick up germs is the water fountain. Most kids are not tall enough to avoid licking the spigot. So, that means all of your other efforts to keep kids healthy are pretty much null and void the first time they ask for a drink. The easiest solution to this problem is to simply allow your students to have water bottles on their desks or on the floor beside their desks. Make sure that your kids have bottles with lids on them or a way to flip the nozzle into the bottle, and suggest ones that are leak-proof and spill-proof. The problem with basic squeeze bottles is that the first time they drop the bottle onto the floor it’s contaminated. (And in all likelihood, it has squirted water all over the child and the desk.) Thus, defeating the purpose of the water bottle in the first place. If the funds are available, have the school purchase water bottles for each student in your classroom. However, if this isn’t an option, consider adding water bottles to the beginning of the school year supply list. This will ensure that everyone has the right kind of bottle. Then explain your reasoning at Open House during the first week of school. Most parents are happy to support any efforts to keep kids healthy. Many classrooms have started going to community supplies for tables or groups. While this idea is wonderful for building community, it’s horrible for spreading germs. Little Johnny has a cold. He wipes his nose while holding the red crayon. When he’s finished coloring, he puts the “germy” red crayon back into the bucket where little Susie picks it up to draw a beautiful heart. Now she has all of Johnny’s cooties. As adults, we’re a little more mindful of keeping our hands away from our faces, but kids don’t think like we do. When their eye itches, they scratch it. Then they deposit every bacterium that they’ve accumulated since washing their hands into their eyes. This is one of the best ways to prevent the spread of germs. No, it shouldn’t be used all the time, but there are times when using soap and water isn’t possible. Whenever, that’s the case, use hand sanitizer. A wonderful way to help your students remember to use hand sanitizer is to use it as a visual cue. Simply have the person who is heading to the bathroom put a bottle of hand sanitizer on their desk. When they return, they can use it. Then they pass the bottle to the next student needing to use the restroom. This is a wonderful way to remind yourself which student is gone to the restroom. It’s also a helpful hint to the students to use the hand sanitizer…especially if they forgot to wash their hands. Another quick and easy tip to ensure you keep kids healthy is wiping down the most used surfaces with Clorox wipes. In the case of a classroom, the desks, light switches, and door handles need to be wiped daily. While this may seem like one more thing you don’t have time to accomplish each day, YOU don’t actually have to do it. Every year I taught, there were always kids who wanted to help clean up while waiting to be picked up. And I know that you have students like this as well. So, encourage them to take on the task of wiping down the desks with Clorox wipes. One thing to remember, make sure your helpers wear gloves to protect their skin from the harsh chemicals in the wipes. You can either let them use disposable rubber gloves or the classic yellow “dishwashing” gloves. Either option will get the task completed without you having to be the one to do it! While there is no way to keep ALL germs out of your classroom, minimizing them is easier than you might think. By implementing these five practices into your day, you can guarantee a decrease in the amount of sickness. And that makes EVERYONE happy! So, I’ve created another set of printables for you! The first one is for your students. This can be something you print and send home or have them keep at their desks. The second is for teachers and would be a great addition to your substitute folder . It’s just a quick reminder of what to do to minimize sickness and how to keep your kids healthy. 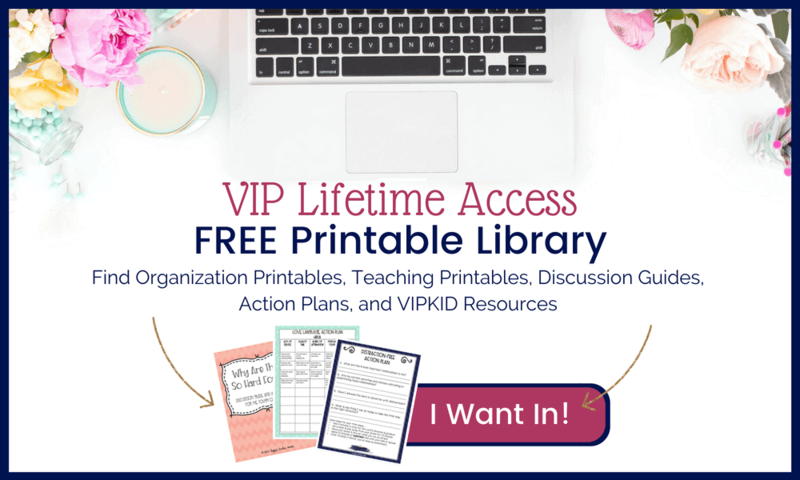 You can access them in my FREE Printable Library!